Kinship Projects are full of stories of children who are haunted by their past. When these kids enter their new Kinship Homes, many of them are shy and scared to the point of being unresponsive. They can’t comprehend that they’ve entered a safe place, because it’s been so long since they’ve experienced it. Coming into a Kinship Home begins the long process of healing their mental and emotional wounds. Caring for these orphans is so much more than feeding them, giving them a place to sleep, and sending them to school. Most of these children have been deeply traumatized and suffer from posttraumatic stress disorder (PTSD). Understanding that and working to heal the wounds of their past is something that is near and dear to the heart of Kinship United. A child experiencing trauma affects them more seriously than an adult would be impacted, because of the brain development that is taking place in children. Early childhood is an incredibly important window of time in a child’s life. A child experiencing trauma affects them more seriously than an adult would be impacted, because of the brain development that is taking place in children (Lubit). The childhood trauma that our Kinship kids have experienced has taken a serious toll on them. 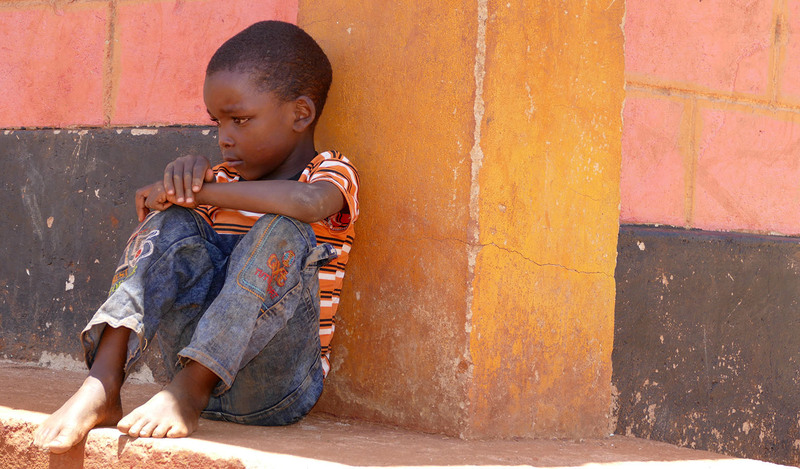 Most of these children experienced traumas such as exposure to war, sexual abuse, severe neglect, and extreme loss, and these things often cause them to suffer from PTSD. Not acknowledging and seeking to heal these emotional scars can be extremely harmful. The trauma that these children experience affects their brain development. Children’s brains are especially malleable, and the damage done by trauma can have lasting consequences on their lives (Center for Youth Wellness 6). Music has been shown to have an effect on a person’s brain chemistry. So how can it help treat PTSD? Nadine Burke Harris describes the affects of repeated childhood traumas in this way: Imagine that you are in the forest, and you see a bear. This danger activates your fight or flight response, in your brain. It activates the production of cortisol and adrenaline. Adrenaline increases the body’s heart rate and causes pupil dilation, so that the body is better equipped to combat the threat. Cortisol increases blood pressure and blood sugar, as well as regulating the body’s metabolism and immune response. This is helpful, she says, to protect you from the bear. But what if the threat isn’t a bear? What if the threat is a parent, and they come home every night? Children who have grown up surrounded by traumatic experiences have their fight or flight response activated over and over again, and this takes a serious toll on their brain. The frequent need for the release of adrenaline and cortisol leads to the body having trouble regulating the process in a healthy manner (Harris). This constant stress on a developing brain has major consequences. A damaged amygdala leads to increased anxiety and fearfulness in a traumatized child (Center for Youth Wellness 8). A damaged prefrontal cortex can result in difficulty focusing, poor memory, and difficulty with critical thinking (Center for Youth Wellness 8). A damaged hippocampus can mean impaired memory and mood control (Center for Youth Wellness 8). This results in long term consequences on brain development, and seriously impacts a child’s life. These constant stresses on a child and the damage done to their brain development have a major influence on their behavior and how they approach the world. These children have grown up in a chaotic world that has always felt out of their control, usually without supportive parents to act as buffers. Because of this, they grow up feeling unsafe, in their feelings, their environment and thoughts (Kelly). Even once they are put into safe environments, the memories and patterns of their once chaotic life follows them. The trauma often results in children struggling with attachment issues as well. Many of the kids who come into our Kinship Homes show symptoms of PTSD, because of their early and extreme exposure to trauma. This can show itself in many different ways. These things can include recurring nightmares, sleep problems, hyper-vigilance, concentration problems, persistent negative emotional states, a loss of interest in important activities, and feelings of detachment (Lubit). These are symptoms exhibited by many of the children who come into our Kinship Homes. They need a secure and loving environment with which to heal, and safe caregivers and a community to give them emotional support (Lubit). And even so, it takes these children a long time to believe that they’re now out of danger. These constant stresses on a child and the damage done to their brain development have a major influence on their behavior and how they approach the world. Kinship United has had success helping our children deal with the repercussions of their past traumas, through treatments like using music as therapy and an immediate involvement in the Kinship Project communities. The stability and safety that the children experience within the Kinship Projects are incredibly important in helping these kids deal with their trauma. Understanding the reality of the horrors that these kids have faced, and providing ways for them to find healing from these emotional and mental wounds, is so important as these children grow into adults. "An Unhealthy Dose of Stress." Center for Youth Wellness, Web. Harris, Nadine Burke. "How Childhood Trauma Affects Health across a Lifetime." TED, Sept. 2014. Web. <https://www.ted.com/talks/ nadine_burke_harris_how_childhood_trauma_affects_health_across_a_lifetime? language=en>. Kelly, Vicky. "The Paradox of Trauma-informed Care." YouTube. TEDxWilmington, 08 Sept. 2014. Web. <https://www.youtube.com/watch?v=jFdn9479U3s>. Lubit, Roy. "Posttraumatic Stress Disorder in Children." Medscape. Web. <https://emedicine.medscape.com/article/918844-overview?pa=rn8dG1rdq1zS8NnhH4YC9k>.